When you think of a beach, what do you imagine? White sand, blue water, warm weather … pretty much the tropics, right? Well, in Washington State, there are very few “normal” beaches. Most beaches are covered in rocks – some pointy and sharp, some just the round variety – but nevertheless, very few of our beaches are the kind you would normally lay a blanket out on and read a book while enjoying some sun. 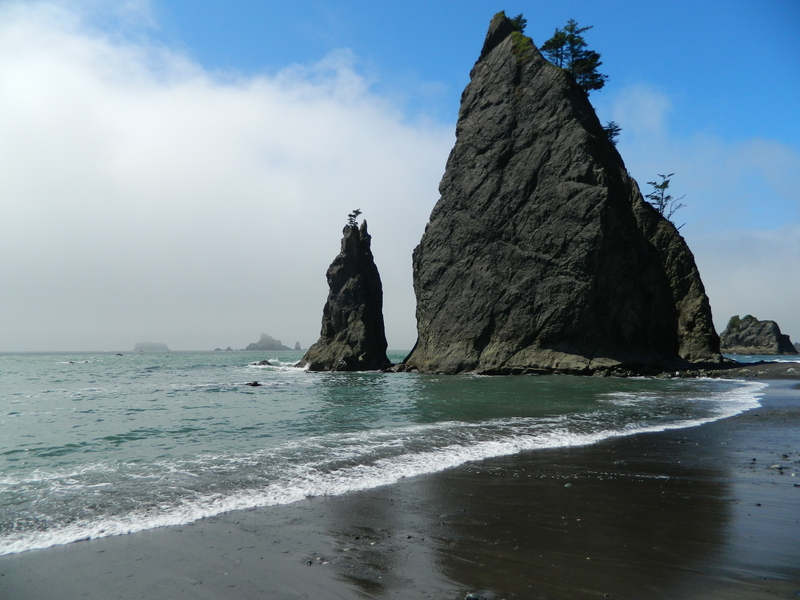 Rialto Beach has plenty of sea stacks just off the coast, offering a look back at wilder times. Instead they feature sea stacks, driftwood, freezing cold water, fog and generally cool temperatures. Henry Weinhard’s beer had a hilarious commercial back in the day celebrating these types of beaches. 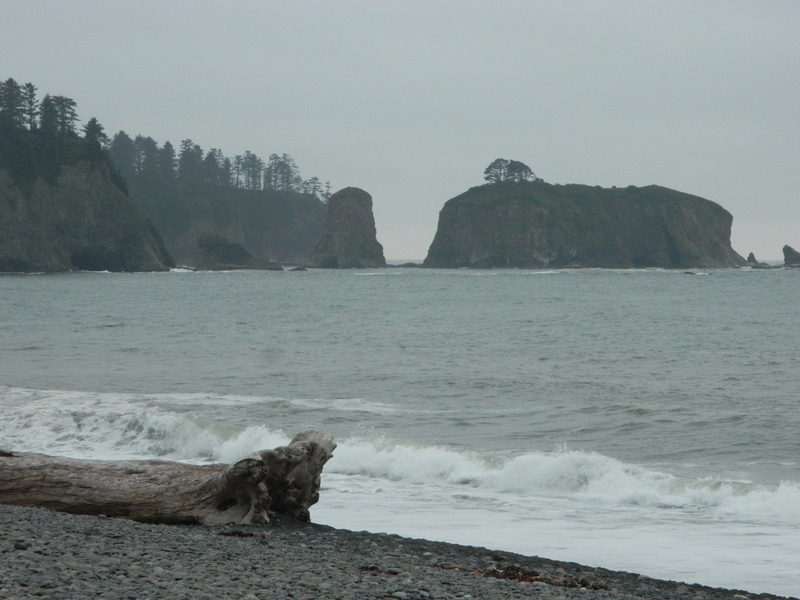 Rialto Beach on the Olympic Peninsula is a carbon copy to the type used in the commercial. Even in August, it is cold, cloudy and mysterious. 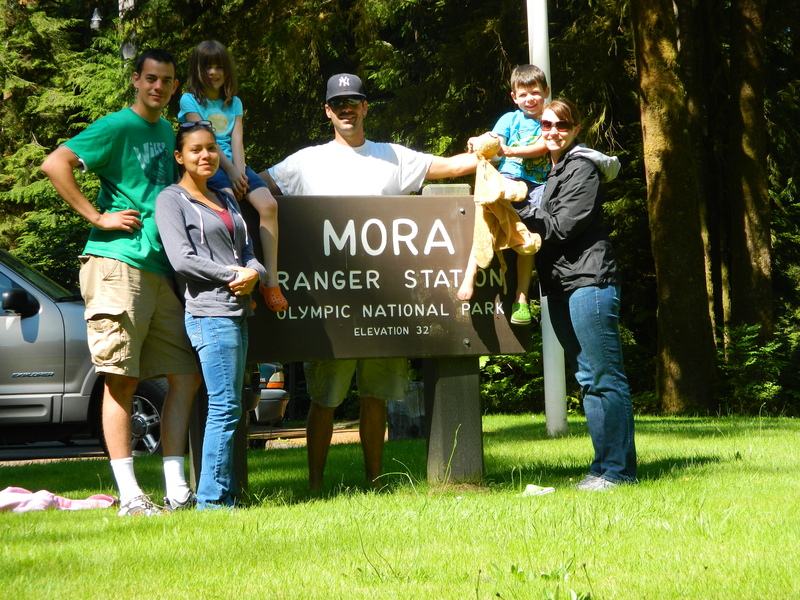 In August of 2012, Veronica and I went camping at the nearby Mora Campground in Olympic National Park with my brother Mick, his wife Kim, and their children, Eleanor and Emmett. Criag, Veronica, Eleanor, Mick, Emmett and Kim pose for the camera at the entrance to the Mora Campground, near Rialto Beach on the Olympic Peninsula. The campground was amazing, with plenty of trees and undergrowth to give some privacy between campsites. But the highlight of the trip was certainly Rialto Beach. The beach features a giant pile of driftwood at the top – as is normal on the Washington state coast. There are numerous sea stacks just off the main beach next to the parking lot, giving the general tourist plenty to see. 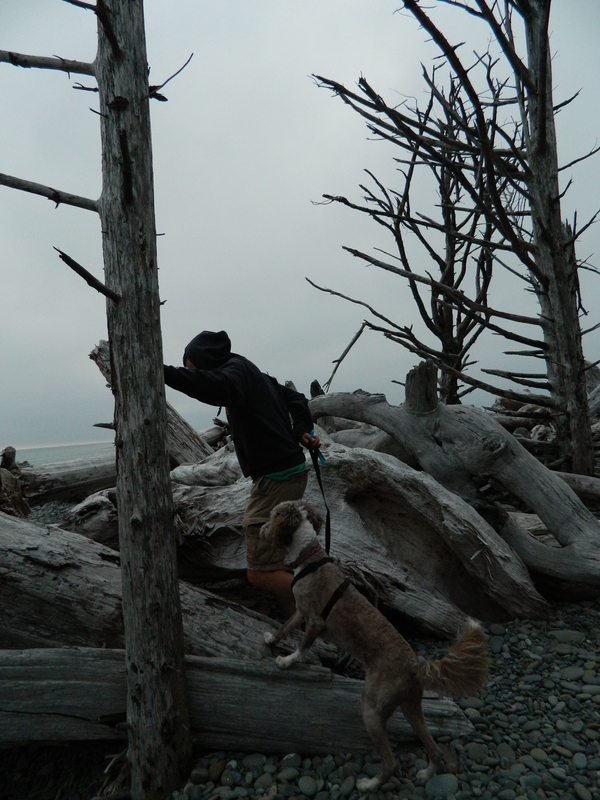 Molly and I trying to scale the driftwood to get to the beach. But the real highlight of the area requires a four-mile roundtrip hike to the north to a stunning area called The Hole in the Wall. Now, there are plenty of holes in the wall on the Washington coast – spots where the pounding waves have created a tunnel in the rock, but this particular spot is easily the largest I’ve seen. As the clouds rolled back at Rialto Beach, they offered an amazing blue sky which augmented the arrowhead looking sea stacks near the Hole in the Wall. At low tide, there are all kinds of creatures on the rocks and in the sand, and the hole in the wall is amazing for its uniqueness. 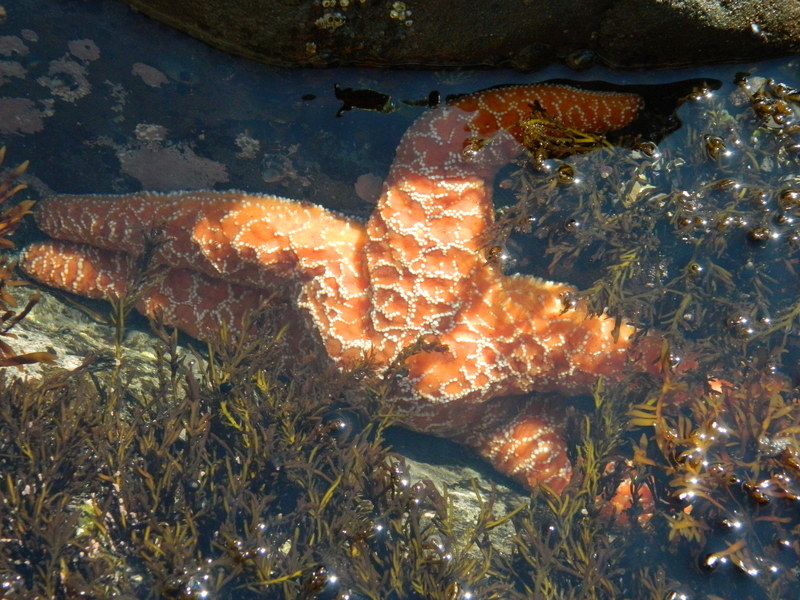 There are plenty of tidepools near the Hole in the Wall, offering a variety of sea creatures. I explored the area with my brother, since Veronica “volunteered” to stay behind with our dog, Molly, because the sign on the beach said no dogs. Plenty of people ignored that sign, but we try to follow the rules when it comes to nature. After exploring the hole in the wall, we sauntered out onto a few of the sea stacks that were easy to climb. While out on one of them, the marine layer decided to roll back and give us some beautiful blue sky and one of my favorite photos in our collection – a sea stack that looks similar to an arrowhead sticking out of the green ocean with stunning blue sky in the distance. In fact, that photo hangs in our dining room to this day. 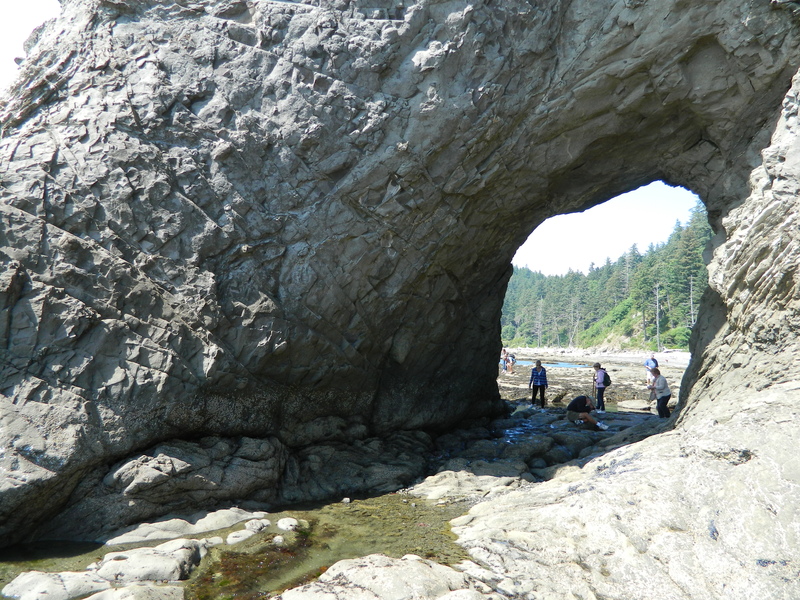 The Hole in the Wall at Rialto Beach on the Olympic Peninsula is an amazing sight. The ocean waves have carved out the tunnel through the sandstone rockhead, creating this spot. It is a magical place, Rialto Beach. Not only for the sea stacks or the hole in the wall or the epic piles of driftwood, but also for its wildness and ability to send its occupants into true nature. 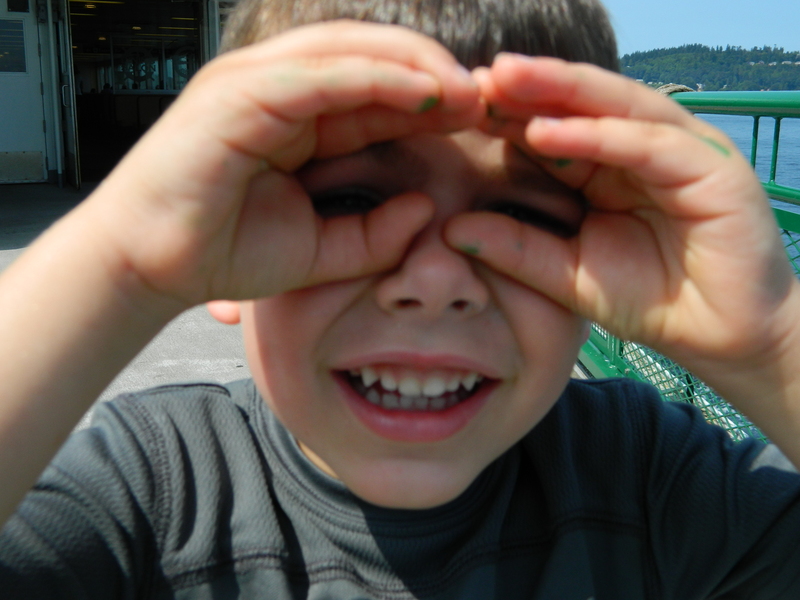 Our nephew Emmett hamming it up on the ferry ride to the Olympic Peninsula.